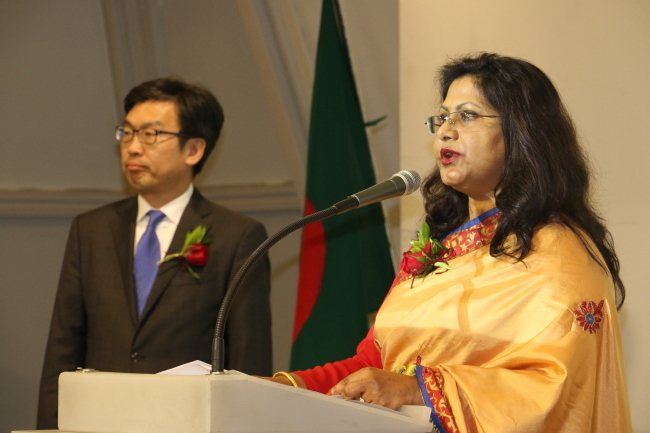 The Bangladeshi Embassy in Seoul celebrated the 47th anniversary of national independence at a reception in Seoul on March 26. The National Day commemorates the South Asian nation’s declaration of independence from Pakistan in the late hours of March 25, 1971. “On this great day, I pay my homage to the greatest Bangalee of all time, father of our nation, Bangabandhu Sheikh Majibur Rahman, whose leadership in our struggle for independence finally culminated in the emergence of Bangladesh as a nation state in 1971, following a long and bloody nine-month war of liberation,” said Bangladeshi Ambassador to Korea Abida Islam in a speech. Bangladesh has come a long way over the past 47 years, contributing to global peace through the United Nations’ peacekeeping operations as a top contributing country in terms of the number of troops, she added. It became the first country to send an all-female contingent to the UN peacekeeping mission in Haiti in 2010. As Bangladesh faces the threat of climate change and the resultant rising sea, the country is playing an active role to reverse global warming, according to the diplomat. “Bangladesh has successfully implemented the Millennium Development Goals and is progressing rapidly toward achieving the Sustainable Development Goals,” she stressed. Bangladesh’s economy is the 44th largest in the world at $273 billion, and experienced 7.3 percent growth last year, according to Trading Economics. It aims to become the 23rd-largest economy by 2050 as envisioned in the “Vision 2041” national development plan, the envoy explained. Its economy -- being the world’s fourth-largest rice producer and fifth-largest producer of fish -- had a foreign currency reserve at around $32.6 billion at the end of February. Bangladesh is the second-largest exporter of readymade garments in the world after China, and its pharmaceutical products are exported to more than 100 destinations worldwide, including the United States and European Union. It also produces and exports large quantities of leather products, frozen fish, ocean going ships, bicycles and ceramic products. “I extend my sincere gratitude to the Korean government for providing humanitarian assistance to more than 1 million Myanmar nationals who were forcibly displaced from their country and have now taken shelter in Bangladesh,” said the ambassador. Suh Jeong-in, deputy minister for planning and coordination at the Ministry of Foreign Affairs, said in a speech that Bangladesh and Korea -- diplomatic partners since 1973 -- have built close friendship and cooperation in diverse areas, with Korea being the top investor in Bangladesh’s thriving garment industry. The bilateral trade reached $1.5 billion for 2016-17. Korea is currently the third-largest source of imported goods into Bangladesh and the first country to establish an export processing zone in Chittagong. The Bangladesh government is in the process of setting up over 100 Special Economic Zones and High-Tech Parks throughout the country. Over 200 Korean companies are operating in Bangladesh, including SK Group, Samsung and LG, employing over 80,000 workers in textiles, leather and other sectors. Furthermore, Seoul has lent loans of up to $500 million to Bangladesh for the 2017-2020 period through its Economic Development Cooperation Fund, which will finance the construction of a railway-road bridge over the Karnaphuli River, ICT training and resource centers and other high-priority projects. The Korea International Cooperation Agency has also actively been involved in developing Bangladesh’s human resources through various projects. The Korean diplomat also lauded the work of some 15,000 Bangladesh people in Korea, calling them a “truly invaluable asset” to the bilateral relations. Noting that Bangladesh graduated from the least developed country status according to the UN Committee for Development Policy, Suh said the two countries “can build a promising future together,” with the two-way trade and investment expected to leap both quantitatively and qualitatively into energy and ICT. “My government unveiled the ‘New Southern Policy’ aimed at dramatically strengthening cooperation with South Asia. I am confident the policy will enable Korea to better connect with Bangladesh,” added Suh.